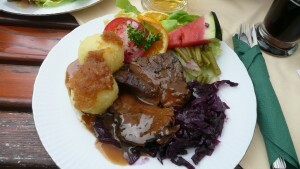 Sauerbraten, or “sour roast”, is a dish well-known in the cookery of Germany and what used to be known as Mitteleuropa. Anyone learning about foreign cuisines in the 60s through the 80s knew about sauerbraten. It’s from the time quiche lorraine, green peppercorns, cassoulet, sole almondine, and coq au vin were popular – and I daresay carbonade flamande, the Flemish beef-and-beer stew. Dishes go in and out of style. This has little to do with their inherent goodness and more to do with fashion and other vagaries. Chuck Cowdery, America’s authority on bourbon whiskey, recently commented here that my carbonade flamande posting made him think of sauerbraten. Indeed, there are numerous similarities. Both use beef as the main meat, and onion, both use vinegar or another souring agent, and both can have a spicy note. In fact, there are numerous dishes across a band of north-central Europe which are broadly similar. Yorkshire had a dish of beef and beer, a harvest dish for farm workers. The Czech Republic has beer goulash, see a good example here, as do Germany and Austria. Poland does a turn in beef or game marinated in beer, vinegar and spices. Similar versions appear yet further east. Each is somewhat different though and assumes finally a national, or ethnic, character. Anyone who knows the sauerbraten may object: but it’s based on red wine! True, but not exclusively. A beer version exists too in the German countries. Below is a recipe for a beer sauerbraten, but first a note about the source. It is from Ruth Vendley Neumann’s Cooking With Spirits, published by Castle Books in 1961. According to Internet sources, Ruth Neumann grew up in the Detroit area before World War II. She trained as a concert violinist but later became an advertising executive in the Chicago area; she had her own agency in Winnetka for many years. This book is what might be called topical (like most cookbooks), not seeking to mark any kind of culinary achievement or stand as compelling social history or memoir. It is mostly a collection of recipes, many of the author’s own devise, which employ in some way beer, wine, spirits, or liqueurs in cookery, from soup to nuts. In the 1950s, cookbook publishers, and probably still today, were looking for a new angle, something to catch the attention of the public. In that period, you saw books on lazy susan cookery, Polynesian food, cooking with leftovers, and outdoor cooking. It’s no surprise someone thought to publish a book using, not just wine or beer, but any sort of beverage alcohol in recipes. There was an element of novelty, even fun, to some of the food writing then. Today, the obsession with supposedly natural food and “clean” eating can cast a Soviet-style humorlessness on dining. The 50s were less sanctimonious. If there was a certain florid superficiality, so what? It was no worse than the studied gravity which attends the business of fueling the body today. In any case, the enthusiasm and “can do” was understandable as a reaction to the strains and privations of the wars recently ended. The publisher of Cooking With Spirits found the right person to write it. The book displays the author’s enthusiasm and optimistic attitude, personality traits which must have assisted her professional (non-culinary) work, too. And for those who look, there are a number of entertaining asides in the book, and useful social history. One is her spare but deft portrait of an Italian-American colleague she encountered in a WPA sewing project in the 1930s. This was a New Deal-era program, for those not familiar with the acronym. The colleague brought zucchini sandwiches from home which entranced Neumann, who gives the recipe, called Zucchini Paganelli. It was her friend’s, except with some Chianti wine added. Another nugget describes a pie Ms. Neumann’s mother made from Concord grapes. She says the only problem with it was you couldn’t stop eating it: “Too darn good”. There is a story of a beef sirloin dish a friend enjoyed during a 1920s fishing trip in Wyoming. The friend, a young executive with General Motors, was introduced to the dish by a “Turkish rug dealer” who had joined the excursion. The sirloin, a 5lb. centre cut, was treated with cognac, chili sauce, and mustard, amongst other things. The result convinced Ruth Neumann that her previous philosophy, “when I eat steak, I want to taste steak”, henceforth required qualification. During the early 1950s she traveled with her husband to Germany and Austria. The early 50s was still a time of shortages and rebuilding in Germany, the place wasn’t on everyone’s “Europe” list then. Perhaps she or (I’d guess more) her husband was of German background, as she mentions they went more than once. The date was October 15, 1953. The Schottenhaml Hotel in Munich was just getting back into shape after the ravages of the war; so when my husband and I arrived there from Cologne, we had to tote our bags through the back door. The front façade still presented a gaping hole where a bomb had made a direct hit. The recipe uses 4 lb. of beef round or chuck, 2 cups wine vinegar, 3 cups beer, 2 onions, 2 tbsp. pickling spices, 3 tbsp. brown sugar, 1 tbsp. salt, flour to dredge the meat, and Mazola to brown. Of course, sour cream enters into it too. Not hard to make but you need time for the marination. Despite the use of beer, the recipe is not like a carbonade flamande in that much more vinegar is used, and the mustard and herbs of the Belgian dish are absent. Still, it is easy to see the general connection. And indeed for cooks in Flanders or Brussels who use spice bread in their carbonade and put in a swirl of crème fraiche to enrich the dish, it probably bears more than a passing resemblance to a beer sauerbraten. The more classic wine sauerbraten does have a different taste though. Bacchus puts it on a different vector! Sauerbraten, any version, is due for a revival. Maybe Anthony Bourdain: Parts Unknown will hunt down a good one, or Rachel Ray. Note re image: This image is in the public domain and was sourced here. Of course all this was too much trouble for our ascendants; that’s why they appreciated the conveniences modern food Luddites take a dim view of albeit in theory only. I’ve used the ginger snaps and found them somewhat disappointing. Their purpose is to thicken the gravy, like a roux, but they didn’t work like that for me. My German grandmothers talked to me about sauerbraten but never actually made it, too much work. I like the gingersnap addition – an analogue to the crumbled spice bread which features in some carbonades – but a cup seems a lot. I’d start with a half-cup and see if more is needed. You want, or I want, only a light binding in the sauce.